Strategic Innovation Fund Supports AIS Tracking | Mentor Works Ltd.
exactEarth is a Satellite Automatic Identification Systems (S-AIS) technology developer that collects and transmits global maritime vessel data. Since 2009, the Cambridge, Ontario-based company has been a top innovator of AIS vessel tracking systems and now captures significantly more data than any other space-based AIS system. With global customers ranging from national governments to coast guards, exactEarth’s data can be easily integrated into existing operational maritime, C2, or geospatial intelligence business processes and systems. As recipients of $7.2 million in funding from the Strategic Innovation Fund, exactEarth will invest significantly into research and development of its real-time (RT) tracking system. Understanding the opportunity to grow as a global S-AIS leader, exactEarth has committed to a three-year research project that will see its real-time tracking system gain new functionalities. The project will be funded in part by the Strategic Innovation Fund (SIF), which offers conditionally-repayable funding to offset a portion of project costs. Through the program, exactEarth will receive up to $7.2 million in funding, then repay a portion of these costs over a period of 15 years. As one of the first developers of Satellite Automatic Identification Systems (S-AIS), exactEarth is recognized as a global leader and innovator. Prior to the development of their low-earth orbit technology, marine traffic was restricted to terrestrial-based solutions that provided limited context towards vessel movements. Today, exactEarth’s proprietary technology can track all AIS tracking-equipped vessels using both ground and space satellites through one platform. With an unparalleled revisit rate, their system is constantly improving to integrate and report on more data in real time. By tapping into the Government of Canada’s Strategic Innovation Fund, exactEarth will further research and develop its real-time exactView RT platform. Demonstrating exactEarth’s real-time technologies is essential to growing the business internationally. This is why the company integrated more than 60 maritime satellite payloads on the Iridium NEXT constellation, a satellite that will detect and transmit AIS signals from marine vessels. Now, exactEarth must find a way to integrate this data with other AIS tracking systems and provide it to users as quickly as possible. Over the next three years, exactEarth will further develop the exactView RT system by expanding on features and providing more accurate, timely data. Developments will improve the system’s First Pass Detection (FPD) to improve data collected in dense shipping areas, while also reducing the amount of time it takes to relay data back to system users. For this project, exactEarth will access $7.2 million in Canadian government funding through the Strategic Innovation Fund (SIF). The program provides conditionally repayable funding to improve company cash flow and provide an incentive for hitting project milestones. Over the next three years, exactEarth will receive $3 million (2018), $2.2 million (2019) and $2 million (2020), which will then be repaid (either in part or in full) over a 15-year period that starts once the project has finished. The Strategic Innovation Fund is a Canadian government funding program that offsets research and development costs to help innovators commercialize disruptive technologies. Companies can apply year-round to receive research funding; if approved, these businesses can access funding to offset a portion of upfront project costs, then pay back the funding once the project is complete. Completing key project milestones can even reduce the amount that needs to be repaid, transforming a portion of this balance to research grants. SIF funding provides businesses with up to 50% of eligible project costs to a maximum $10 million in conditionally repayable funding. To qualify for the Strategic Innovation Fund, applicants must have high growth potential and the ability to drive innovation. Projects should ideally span from three to five years and incur costs of at least $20 million to be considered substantial enough for funding consideration. Most businesses can submit an application year-round; all applications should be submitted well in advance (six months or longer) ahead of the project’s start date to receive approval and begin incurring funding-eligible expenses. The Strategic Innovation Fund is one of many Canadian government funding programs that can support research and development projects. Canada’s federal and provincial governments offer a vast array of funding programs to support growth and innovation; the key is understanding what these incentives are and how to access them. Fortunately, companies can learn more about the government funding landscape by exploring the Canadian Business Funding Guide. 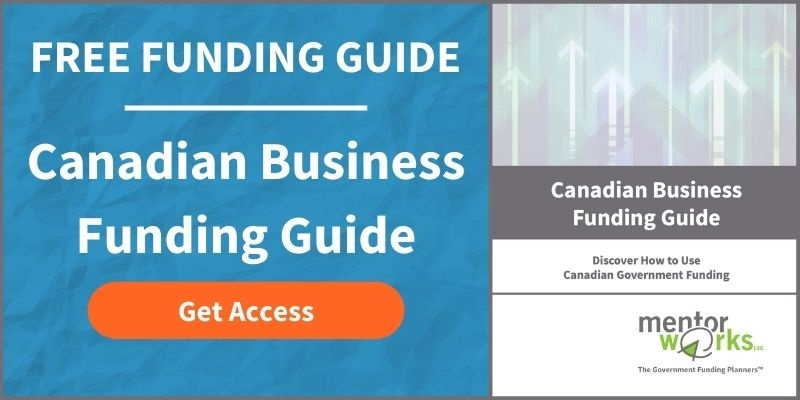 Access the Canadian Business Funding Guide to learn more about types of government funding and basic eligibility criteria needed to be considered for funding.